On retrouve des dubs d’inspirations différentes: steppa, UK dub. Au trombone, “Buttons” des Matic Horns. interprété par The Legendary Congos. L’incontournable Sizzla Kalonji, avec “Mother Earth”. Rod “Rocky T” Taylor, avec “A New Song”. Masterisé à Londres par Dougie Wardrop, label Conscious Sounds. 01 A new song - Rod Taylor.mp3 Acheter ! 02 A new Dub - Artikal Band.mp3 Acheter ! 03 Cool Down - THE CONGOS.mp3 Acheter ! 04 Cool Dub - Artikal Band.mp3 Acheter ! 05 Mother Earth - Sizzla.mp3 Acheter ! 06 MOTHER Earth DUB - Artikal Band.mp3 Acheter ! 07 Jah Army DUB - Artikal Band.mp3 Acheter ! 08 Jah Army DUB melodicamix - Artikal Band.mp3 Acheter ! 09 Lightning DUB - Artikal Band.mp3 Acheter ! 10 Lightning Dub Melodicamix - Artikal Band.mp3 Acheter ! 11 Ghana Dub - Artikal band.mp3 Acheter ! 12 Cool Dub trombonemix - Artikal Band.mp3 Acheter ! 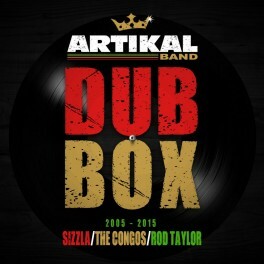 Artikal Band Dub Box 2005-2015 full album MP3.zip Acheter ! 12 Cool Dub (trombone mix).